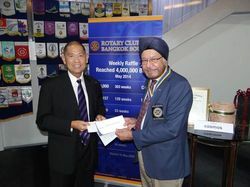 On March 25th, 2016, the National Bailliage of La Chaine des Rotisseurs donated for a second Time, Baht 75,000 to The Rotary Club of Bangkok South. The donation is used to fund the installations of clean drinking water system for schools in the Northern provinces in Thailand. Although Thailand is generally blessed with ample water resources, the availability of clean drinking water is often a problem, particularly in up-country areas. Many children in rural Thailand drink untreated or poorly treated water at their schools, making The children ill and impairs their studies. 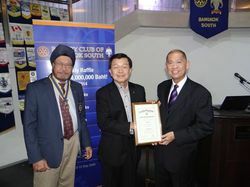 In 1996, The Rotary Club of Bangkok South initiated a Clean Drinking Water for Schools Program to install water purification systems in rural schools. To date, 500 such systems have been installed in over 30 provinces. The system uses Reverse Osmosis technology, which is relatively inexpensive and easy to maintain. A standard system produces sufficient water each day for up to 400 students and each system is good to provide clean water for 10 years or more. 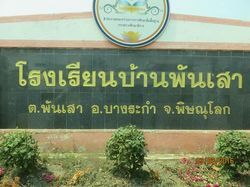 Back in 2012, La Chaine donated to Baan Pan Sao School in Phitsanulok. Rotary representatives went on an inspection tour in February 2016 and found the systems to be in good order and proper maintenance. 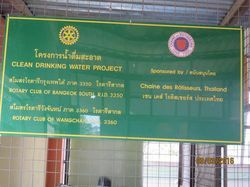 Bangkok Chaine members are proud to be a sponsor for this worthwhile project. Aside from sharing pleasures of the table among members and friends, we are all making a small contribution to show care and compassion for the young children of Thailand.